Found on Gilbert Bridge deep within the highwalks of the Barbican Centre and beside the library-level entrance, the Barbican's Comedy & Tragedy sculpture was created in the mid-1990s by artist Matthew Spender. 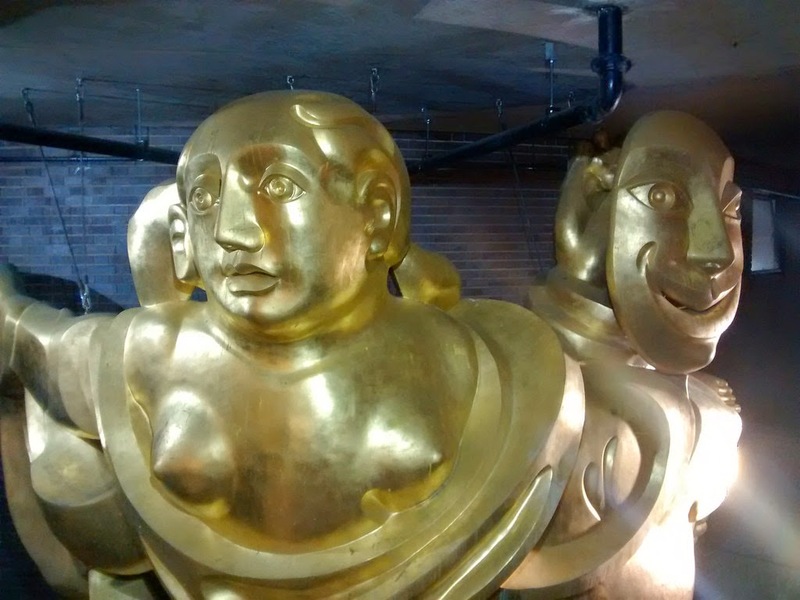 The sculpture shows the golden Barbican Muse, a floating, reclining female figure, holding up the masks of comedy and tragedy, presumably in some sort of reference to the arts that go on in the neighbouring arts centre, apparently the largest in Europe. 'deep within the highwalks'. Good description of the pedestrian walkways round the Barbican. I enjoy exploring the estate, but am still not sure I have found every publically accessible nook and cranny.